Fig. 67 Production-line balancing. A simple example. the assignment of equal amounts of work to sequential work stations on the production line. This is necessary to avoid idle time or ‘balancing loss’ since the work stations at each production stage (for example drilling, milling, etc. in Fig. 67), although having different types of work to perform, are all required to work on the same number of items in any one time period (12 per hour in Fig. 67). The task of production-line planning requires the total work to be divided among work stations where a worker or group of workers performs the same operation continuously on successive items. Alternatively, certain work stations may employ automatic machines (numerically-controlled machine tools or robots) to perform operations. The output of production lines is determined by the ‘cycle time’ at the work stations, i.e. the time it takes for the workers or machine to complete the work task required. The number of work-stations at each production stage must be balanced so that each production stage can deal with the same number of items (i.e. 12 in Fig. 67). If the average cycle time is, say, five minutes, then the output from the last work station, and consequently from the production line as a whole, is one item every five minutes or twelve items per hour. 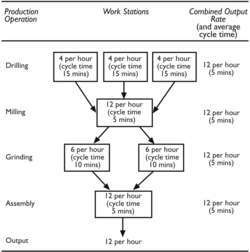 A planned work pace of twelve items per hour could leave some machines underutilized; for example, the milling work station could be capable of producing 15 items per hour or one every four minutes but will be constrained to operate at less than capacity to maintain the same output rate as prior and succeeding work-stations. By contrast, if only one grinding work station rather than two were available this would create a ‘bottleneck’ constraining the output of the whole production line to just six units per hour. Whereas machine-based work stations have constant cycle times, work stations using human operatives are likely to experience a degree of variability in cycle time from the STANDARD TIMES established by work measurement techniques. To deal with this variability some flexibility can be built into the production line by introducing buffer stocks of materials or components between work stations. Buffer stocks also serve to prevent disruption to later ‘down stream’ production operations if machine breakdowns or labour problems have occurred at earlier production phases.